November 23, 2015 by Justin Arocho, Ph.D. Statements like these are likely familiar to many of us. Most of us are good at identifying changes we would like to see in our lives. However, effecting these changes is often more difficult than identifying what they are — easier said than done, as they say! Sometimes we feel overwhelmed by the size of the goal before us, and we simply do not know where to start. Other times we try to achieve a goal, but it just doesn’t work out. In these situations, it’s easy to feel discouraged and give up. 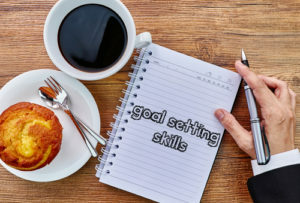 Goal setting can also be helpful when addressing emotional or behavioral difficulties, and is a valuable tool often used in cognitive-behavioral therapy (CBT). For example, someone who is depressed and isolated may work with his CBT therapist toward a goal of increasing the number and strength of his friendships. Someone experiencing anxiety related to her job may work with her CBT therapist toward exploring a career change or making time more often for relaxation and leisure. Because goal setting strategies are often used in CBT, this therapeutic approach is particularly helpful for those struggling to meet their goals, regardless of what those goals may be. The following goal setting approach is based on the methods used in CBT, but can be helpful for anyone. Identify the steps. It can be easy to forget that achieving a goal is rarely accomplished in just one step. Break down your goal into “chunks” by identifying all of the steps it would take to get from your start point to your goal. Ask yourself, “How can I break this down to make it more achievable?” Keep each step small. Small steps are more achievable than big ones. When you feel successful for accomplishing small steps along the way, it helps motivate you to keep moving toward your goal. Also, if you surpass your goal for a small step, you can feel proud for going above and beyond! Put the steps in order. Ask yourself, “What could be the first step toward my goal?” and then “What could be the next step?” and so on. Focus particularly on the early steps. Consider potential obstacles. Think about what could get in the way of accomplishing the steps you have laid out, and work through or around these as best you can. No one can predict all potential obstacles, but by considering these now, you will be better able to work around problems as they arise. Get started with the first step in your plan of action. Following these steps will help you feel more able to achieve the goals you set for yourself and also make the goals easier to achieve. Specific. Be as specific as possible so you can tell when you have completed a goal or step. “Get more exercise” is vague, but “Go for a walk around the block 3 days each week” can be easily checked off your list of steps. Measurable. Making goals and steps measurable means you can track your progress over time. In the example above, specifying “3 days each week” gives you a way to measure the change in your exercise habits. Achievable. Make sure the goal you have chosen can actually be attained. It may be great to aspire to win millions of dollars in the lottery, but it is unlikely you will achieve that goal, no matter how good of a plan you devise. Relevant. Make sure the goal you have chosen is in line with the issue you are trying to address. Learning to be a better public speaker is a great goal, but perhaps not the most relevant if your greater aim is to make more friends. Timely. Make sure that now is a good time to work toward this goal. For example, aiming to clean out the attic may be a wonderful goal, but not if you are still recovering from back surgery. In pursuing your goals, if you find that that you are not able to complete a particular step along the path to your goal, take a closer look at it. It is possible that the step was too big, so do not be afraid to break it down further and go from there. It could also be that the step was not SMART from the start. See if you can rework it to make it one you can tackle. Learning goal setting skills takes practice, but can be invaluable in helping you do those things you have been avoiding or “just don’t seem to get to” and feel a sense of accomplishment. Finding the right therapist can be difficult; consider consulting with a CBT therapist if you think therapy may be helpful for you in reaching your goals.